We chat with the Irrigation Association about the state of irrigation regulations and what contractors can expect in 2017. Water issues remain on the forefront in many regions of the country in 2016, keeping the irrigation industry under the microscope on local, state and federal levels. With Republicans taking control of Congress and the White House at the beginning of the year, the futures of several important legislative bills and agencies that focus on water use now hang in the balance. John Farner, government and public affairs director for the Irrigation Association (IA) in Fairfax, Va., discusses irrigation regulations and what irrigation contractors can expect in 2017. Q: What’s the state of government regulations as they relate to landscape irrigation on the federal, state and local levels? A: This year brought many challenges and opportunities for the irrigation industry. In the West, the drought enters its sixth year and continues to drive legislation and regulations affecting water use for irrigation. In the Southeast and Northeast, we’re seeing a newer, yet lingering, drought that’s beginning to affect water use and availability. However, throughout the U.S., potable water use for irrigation, licensing of irrigation contractors and the overall installation and management of turfgrass and landscape plants continue to be under a microscope. In Washington, D.C., all eyes were on the election. Important bills, such as the Water Resources Development Act, stalled in conference committee—a committee made up of representatives and senators to negotiate differences between the House and Senate bills—and now may not pass, as Congress looks to punt the majority of legislative action to 2017, when Republicans will control Congress and the White House. Q: How might the outcome of the election impact the irrigation industry? A: President-elect Donald Trump ran his campaign on being a Washington “outsider” and doing things differently than they have been done in the past. This can mean different things to different people, but one thing is for certain: We are in for a large ideological shift compared to the past eight years. While the campaign and transition have not provided specific details on much of his legislative agenda, we know a few things thus far. Immigration enforcement will be a primary focus during the first 100 days. While Mr. Trump has gone on record stating that he understands the specific needs of agricultural labor relating to immigration, he has not called out any other industry. While he has not mentioned any stance on H-2B visas, we can expect that we will learn more in the early days of his administration. Mr. Trump campaigned on the position that the new Waters of the United States regulation, which increases the scope of the Clean Water Act, is government overreach and will be eliminated. With that said, we expect many of the regulatory programs (and possibly voluntary programs such as WaterSense) to be significantly reduced or eliminated under the Trump Administration. We at the Irrigation Association are watching the presidential transition closely and remain ready to work with the new officials at the Environmental Protection Agency, the Department of Agriculture, the White House and others who will have an effect on landscape irrigation water use and regulations. Q: Are any states particularly concerning or receiving a lot of attention right now? A: California seems to always be the most active when it comes to legislation and regulations affecting the landscape irrigation industry. Because the current drought is becoming the “new normal” in California, we expect this trend to continue for years to come. However, states like Illinois, North Carolina, Georgia, Connecticut, Colorado, Massachusetts and Florida, among others, continue to be on our radar. The issues facing these states range from the practice of irrigation by an irrigation contractor (licensing), to drought plans and preparedness, to backflow prevention device testing, to the use alternative water sources, such as rain barrels. We expect the trend of states’ involvement in landscape irrigation policy to continue to increase over time as more strain is placed on municipalities to provide enough potable water throughout their service areas. 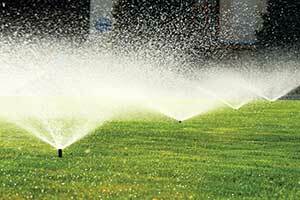 Q: What irrigation regulations should landscape and irrigation contractors be paying attention to now and in 2017? Potable water use for irrigation. As drought pops up in different areas (West, Northeast, Southeast), major strain is placed on water sources for different uses of water (municipal, agriculture, environment, etc.) Because the majority of water used for landscape irrigation throughout the U.S. is potable water, regulators will be looking to irrigation first for potential water savings. Scope of practice. This is an issue we have been working on for quite some time. Unfortunately, especially in states without a landscape irrigation license, we are seeing other trades (plumbing, landscape architecture, etc.) attempt to define irrigation under their license. For example, in Illinois and Connecticut, the irrigation contractor license is administered by the plumbing board. The IA believes that if irrigation contractors are licensed in a state, they should be governed by a board of their peers due to the technical aspects of irrigation. Drought. States are beginning to realize that drought can hit at any moment and sustain for a long period of time. Therefore, drought plans are being drafted throughout various states. Though landscape irrigation water use is a “first line” of water savings, turning off access to water for landscape irrigation should be done only as a last resort. Technology efficiency improvements, audits and proper management should be part of a sustainable drought plan. We anticipate other issues to pop up as legislatures convene in January. We will keep issues updated at Irrigation.org on a regular basis. 1 Comment on "Irrigation outlook for 2017"
I had found some of your post and it very interesting especially about landscaping. I have a landscaping services which serves in Santa Barbara, and i would like to have a chance that my content to be publish as guest post.Is there any option and opportunity to get publish here at landscapemanagement.net? Please message me about what you need so that i can provide it.